DOCTOR OF THE CHURCH This Doctor of the Church was born in Damascus, Syria, and his father was a government official under both the Byzantine emperor and the Muslim rulers of Damascus. 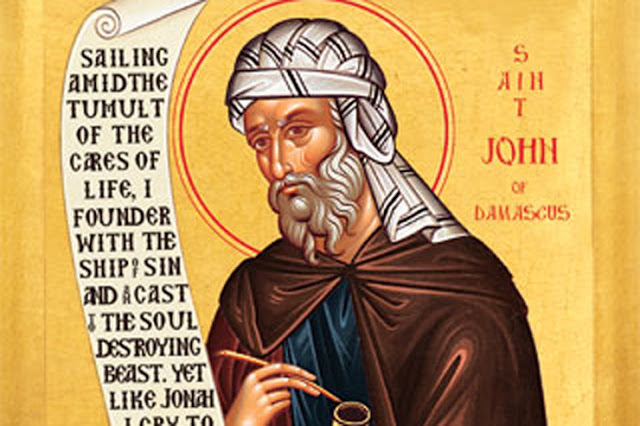 Receiving an excellent classical education, and fluent in Arabic as well as Greek, St. John Damascene worked in the Muslim court until the hostility of the caliph toward Christianity caused him to resign his position, about the year 700. He migrated to Jerusalem and became a monk at Mar Sabas monastery near Jerusalem. He taught in the monastery, preached many of his luminous sermons in Jerusalem, and began to compose his theological treatises. It was about this time that the iconoclast controversy shook the Churches of the East, when the Byzantine emperor ordered the destruction of images in Christian churches. John fought the heresy, bringing down upon himself the wrath of the emperor and the hatred of the iconoclast party. He has left a rich legacy of writings, including his principal dogmatic work, , which was a , a refutation of heresy, an exposition of the Orthodox faith, and a study of contemporary religious issues. His writings on Mary constitute a true theology of the Mother of God, and his sermons of the saints, the liturgical feasts, and the Gospels show not only vast learning but also give us information about local customs and contemporary happenings. Since he lived in the midst of political and theological turmoil, John wrote much to clarify true doctrine and to do his part in spreading the Gospel. The fact that he lived and worked in Jerusalem itself gives his sermons, delivered at many of the holy places, a special appeal. He died at a very old age, some say one hundred four, in the midst of his labors, beloved by his fellow monks and revered by the people. He was buried at the monastery of Mar Sabas and was declared a Doctor of the Church in 1890.